The city of Vitoria has inaugurated a new bridge over the river Zadorra that links the centre of the city with the district of Abetxuko, thus overcoming the historic separation between the two zones and providing fluid communications. With this new infrastructure, Vitoria city council wanted, besides facilitating circulations, to generate more social heritage for the city. Ingeniería Pedelta, who have been in charge of designing this bridge-sculpture, has opted for the use of materials of local tradition to build this bridge that wants to become an architectural symbol for the Basque capital. The new structure is five times as wide as the old bridge –thirty-one metres wide versus the six metres of the previous one– and ninety-two metres in length. Its six hundred tons of steel and a forceful foundation that sinks ten metres into the rock –to prevent problems derived from the swelling of the river—give it a strong aesthetic and personality. 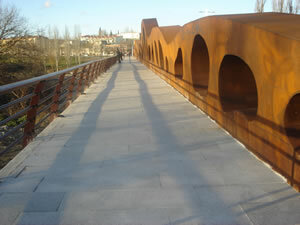 The team responsible for the creation of the bridge, which has defined the structure as a living work capable of fitting into its surroundings, has used corten steel to recall the work of Basque artists such as Chillida or Oteiza. In addition, the bridge has the property of changing in colour over time, something that, together with the shadows it projects at certain times of the day, transforms it into a structure that changes together with its surroundings.